Hiawassee, GA: HighWalk Productions, Inc., 2011. All children are unique and all parents want to look back at their children and be able to say “well done”. Hence the title: Rare Kids; Well Done, the author, Don Jacobsen, has intentionally given to this insightful book on parenting. This book emerges from the author’s heart with years of experience as a parent and parenting educator merged with extensive knowledge of biblical studies. Dr. Don, as the author is referred to throughout the book, builds Rare Kids; Well Done around the premise of three desirable characteristics parents need to instill in their children: to be respectful, responsible and obedient. He uses humor, heart-warming stories, past and present data, personal experiences and a tone that is unapologetic and at times very direct as he sensibly outlines effective principles for raising children with moral values in contemporary times. “Our world needs your kids.” The author posits to parents that having children was the most important decision they made; thus imploring parents to consider the opportunity they have to help their children find their purpose on earth and become change agents in their world. In essence, parents are tasked with leaving a legacy of strong character and values to their children and their children’s children for generations to come. Rare Kids; Well Done is filled with charming vignettes and some seemingly trivial facts which Dr. Don uses to describe parenting styles in layperson’s terms. For example, he talks about Kudzu, which is a vine that ravages anything it grows on, to describe parents who micromanage their kids. Dr. Don also shares wonderful examples of how parents can fill their homes with joy and laughter and learn to “lighten up”. He encourages parents to laugh off mistakes and learn to distinguish between an accident and a rebellious act. He includes a chapter of five reasons why parents should never argue with their children, but you will have to read the book to find out those reasons. So often parents think about what their children can’t do. Dr. Don encourages parents to think of themselves as “coaches” whose task it is to help their children envision all the things they can do. Imagine how differently we might parent if we remember that our children today will emerge as the leaders of tomorrow and quite possibly discover the cure for currently incurable diseases! Most importantly, imagine our most important task as parents is to prepare our children to be disciples of Christ on this earth and for life in the earth made new. Rare Kids; Well Done is well written and very easy to read; its message is encouraging, inspiring, and insightful – straight forward but non-judgmental. It is biblically, psychologically, and developmentally sound, and could easily become the parenting guide parents keep on their nightstands as a quick reference guide for parenting from birth to young adulthood and beyond. 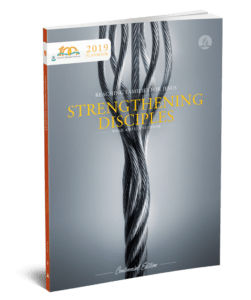 Family Ministries leaders will find it a very useful ministry resource for empowering families in their journey of parenting. See www.RareKidsWellDone.com for more information on this resource.